Today has by far been the best day here so far. We rose at 7 AM, showered and had breakfast. I tried the American breakfast today (2 boiled eggs, toast, juice, tea and something that was cut into the shape of a flower-although tasted like fried hot dog) the latter turned out to be breakfast sausage. All in all, a great meal. We met with a kid from Toronto (Kyle) and an Austrian girl (Monica) after breakfast. 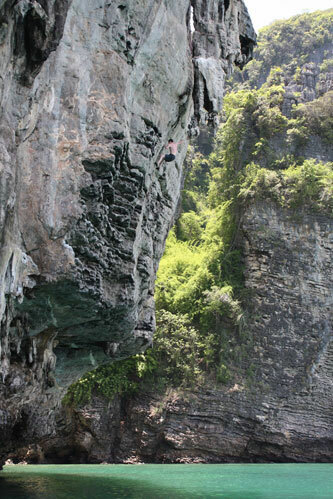 Kyle was psyched to be joining us deep water soloing today. 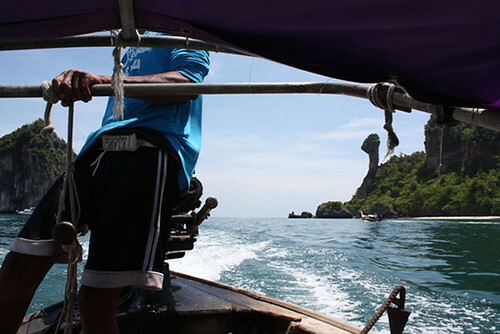 We caught a long-tailed boat at about 10:30 with our guide Rom from King Climbers. 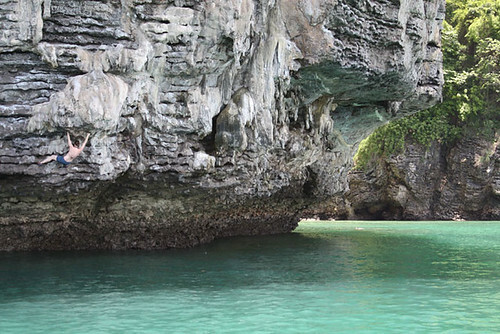 We then headed to Koh Po Da for our first climbing adventures of the day. I did a fun and fairly easy traverse, while Patrick climbed to 18+ meters up to a stalactite. 18 meters up and going for it. Hard climbing from the kayak to the ladder and up the rock, but once we were on the wall the climbing was fairly easy. 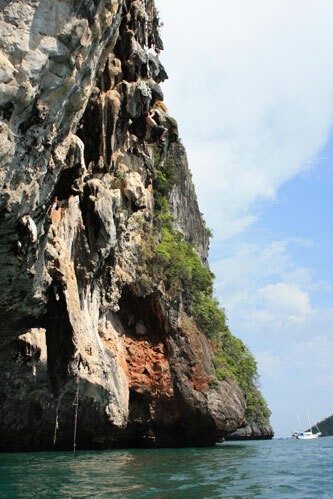 I wasn’t sure how my ankle would do with hitting the water, so I was nervous to climb very high. Hitting the water and jumping from the rock was exhilarating. I do wish that my blasted ankle was more reliable, so I could have jumped from a much higher point. Then we headed to a “semi”- deserted beach for a lunch of Khao Pad and relaxation in the sun. Patrick and others did some bouldering here. We then headed to Chicken Island after a brief stop at a very small white sand beach for snorkeling. The Chicken Island climbs were much higher and more intimidating! Patrick loved it and was by far the best climber of the group.